The Vortex Pro Combi External 36kW Oil boiler is a floor-standing unit which uses high efficiency, condensing technology. Designed and manufactured by Grant, this boiler is a Combi which means it is a water heater and a central heating boiler wrapped into one. One of the main benefits of this i that you don’t need a hot water cylinder or feed tank. 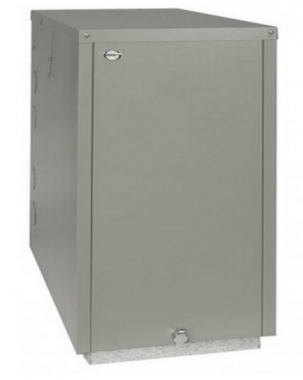 As an external boiler it has been designed to be placed outside which means you save space in the home. This highly reliable unit has an efficiency rating of 94.5% making it A rated. It has a relatively high output rating of 36kW which perfect for the larger homes with more than one bathroom and a higher demand for heating and hot water. This unit comes with a variety of features and benefits such as a neon diagnostic indicator, a high efficiency circulating pump, a unique stainless steel heat exchanger, a Riello RDB burner with plug and socket connection and a 4 litre expansion vessel. This vessel is normally located behind the front door of the boiler but in this model is supplied as an externally fitted vessel kit. This unit has a simple and quick installation due to minimal wiring and plumbing which should help to save you money on installation. This model is available in 4 output options: 21kW, 26kW, 26kW XS and 36kW. This boiler includes a 5 year warranty and has been awarded Which? Best buy, so you can be sure that is a high quality appliance.